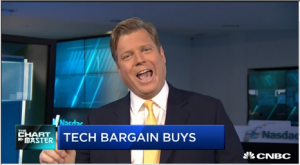 Carter Worth the head of technical analysis at Cornerstone Macro with several bearish observations on the tech sector – the news is not all bad. 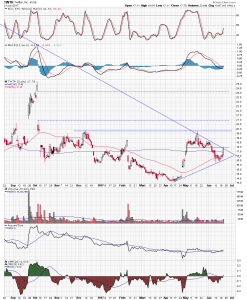 Twitter (TWTR) may be about to get hot. Twitter shares were up over 5% in trading on Wednesday, retesting a downtrend line drawn off the 2013 and 2015 highs. 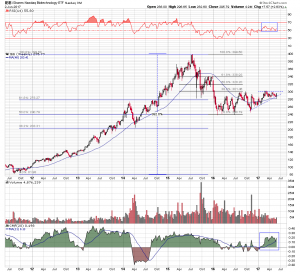 This trend line has defined the long-term decline that began two months after the stock became publicly traded, and it is currently intersecting with an 18-month horizontal support line. The merging of these two trend lines could be a strong influence on the intermediate-term direction of the stock price. At this time, resolution looks like it will be to the upside, making Twitter a profitable buying opportunity. The longer timeframe chart shows the decline that began in early 2014 that delineates the downtrend line, and the 18-month horizontal support line which could be acting as a base. In April, support was successfully tested and the subsequent bounce took the stock price back up to the downtrend line. It has made several attempts since that time to break through resistance. This current attempt is being supported by positive momentum indications and improving money flow readings. The stochastic oscillator is moving out of an oversold condition and made a positive crossover, and moving average convergence/divergence is in the process of making a bullish crossover. Chaikin money flow has moved above its center line and its base component accumulation/distribution is crossing above its signal average. The stock has a lot to prove, but having arrived at this nexus of support and resistance, it may be prepared to make a decision. 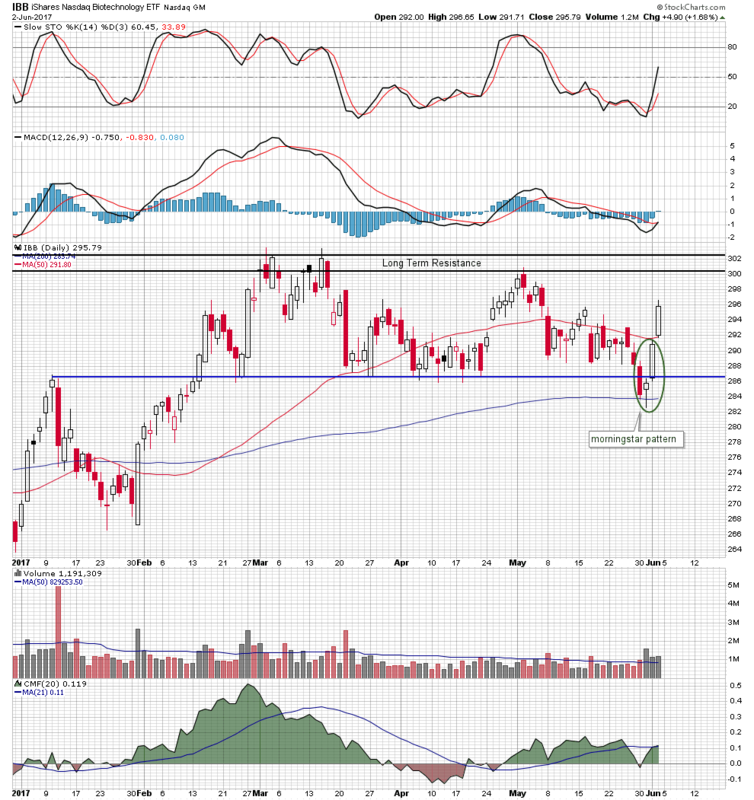 Twitter is a speculative long candidate after an upper-candle close above the $18.00 level, using a tight and disciplined trailing stop. Twitter shares rose 2.6% to $18.25 early Thursday afternoon. 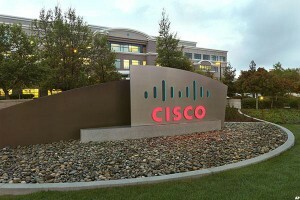 Cisco Systems (CSCO) is undergoing a process of consolidation on its daily chart that could result in a volatile move higher. Shares have been trading in a narrow horizontal channel pattern, which has compressed the price range to a near-breaking point. 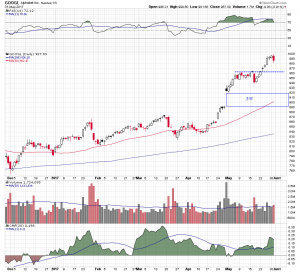 Last month’s large gap lower created an upside resistance vacuum, and the momentum and money flow indicators suggest the stock is prepared to fill the void. Here’s the current technical condition of Cisco and the breakout level that could trigger an initial 5.5% rally. 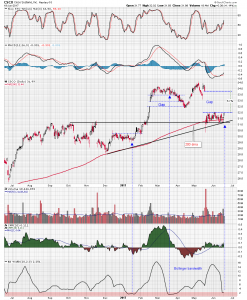 The daily chart shows Cisco shares bouncing off their 200-day moving average in December last year, and then going through a period of lateral consolidation. Bollinger bandwidth contracted to a very low level during this time, reflecting the lack of volatility. But, periods of low volatility are often resolved by periods of high volatility. The subsequent break above channel resistance was followed by a sharp move higher, and in the process a small gap formed between the $33.00 and the $32.50 levels. A second period of consolidation began, again compressing Bollinger bandwidth, and this time the subsequent breakdown, took the price lower and closed the gap. The stock has, once again, been trading in a tight horizontal channel, just above a long-term uptrend line, its 200-day moving average, and the 2016 high levels. Channel resistance is located in the $32.00 area, with little in a way of further resistance until a large downside gap that formed last month is filled just below multiple year highs. The stochastic oscillator is moving above its center line and the moving average convergence/divergence is making a bullish crossover. Chaikin money flow is in positive territory and the Bollinger bandwidth indicator is reflecting another level of tight compression, and the potential for a volatile move. 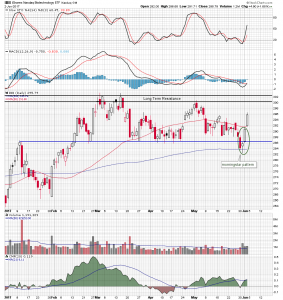 Cisco is a long candidate after a break above current channel resistance using an initial stop under the intersection of support in the $31.00 area. 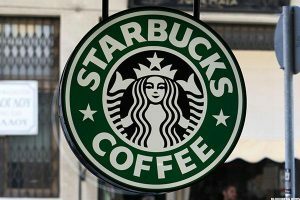 Shares of Starbucks (SBUX) began forming a rising triangle pattern in November last year, oscillating around their flat 200 day moving average, and making a series of lower highs and higher lows. 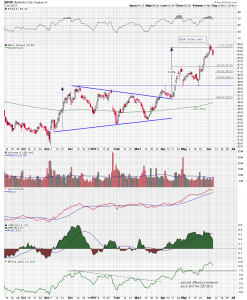 Pattern resistance was broken in March this year and over the following three months the stock rallied to a perfect measured move in the $65.00 area. This pattern price objective is arrived at by taking the height of the triangle and adding it to the breakout level, and in this case, it represented a 12.5% gain. In Monday’s session the stock opened higher but immediately began pulling back, closing near its low and forming a dark cloud cover candle. A dark cloud candle is a bearish reversal sign but like all candles or patterns requires confirmation. That confirmation came in the form of Wednesday’s large dark candle, suggesting there is more downside to come. The first level of potential support is the April high in the $61.70 area, also the 38% retracement level of the breakout rally range. There are two technical indications on the chart that provide additional confirmation and suggest the stock price may be overextended. It has diverged above its 200 day moving average by its widest percentage margin in over a year, and the relative strength index is moving out of an overbought zone. Chaikin money flow is still well into positive territory but has dropped sharply this week and is below its 21 period signal average. 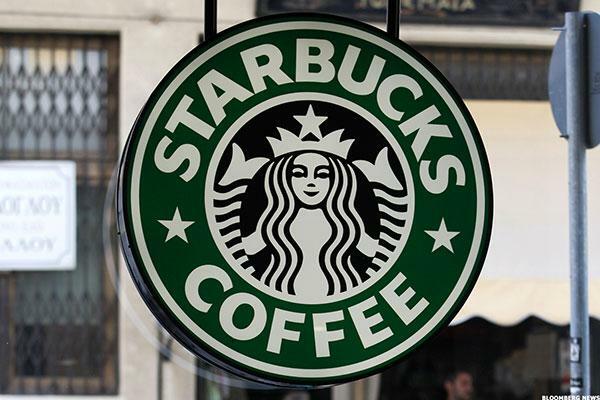 Starbucks is a speculative short at its current level using a position signs that accommodates a buy-to-cover stop above its recent high. Short positions are by their nature speculative and require a disciplined trading strategy. It isn’t panic, but a sense of concern has become evident in the stock market. The Volatility Index (VIX) is up over 7% this week, while gold is up about 6% over the past two weeks. Crude oil prices have reacted to renewed tensions in the Middle East and the SPDR S&P Metals and Mining ETF (XME) looks like it may have formed a triple bottom on its chart. The way to position for, or to play a potential shift in investor sentiment, may be in the precious metal and the gold mining stocks. The weekly chart of the SPDR Gold Shares ETF ( GLD) shows the fund breaking below a long term uptrend line in September in 2016 and dropping 17% into the end of the year. That low turned out to be the bottom of a large cup and handle pattern with rim line resistance positioned at the 62% retracement level of the pullback. 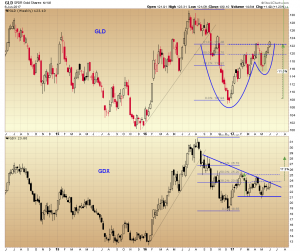 The VanEck Vectors Gold Miners ETF (GDX) has been trading under a sharp downtrend line and above horizontal resistance in the $21.00 area this year, forming a triangle pattern on its weekly chart. It has moved back up to retest the trend line, currently intersecting with the 38% retracement level of its August 2016 high and December low. 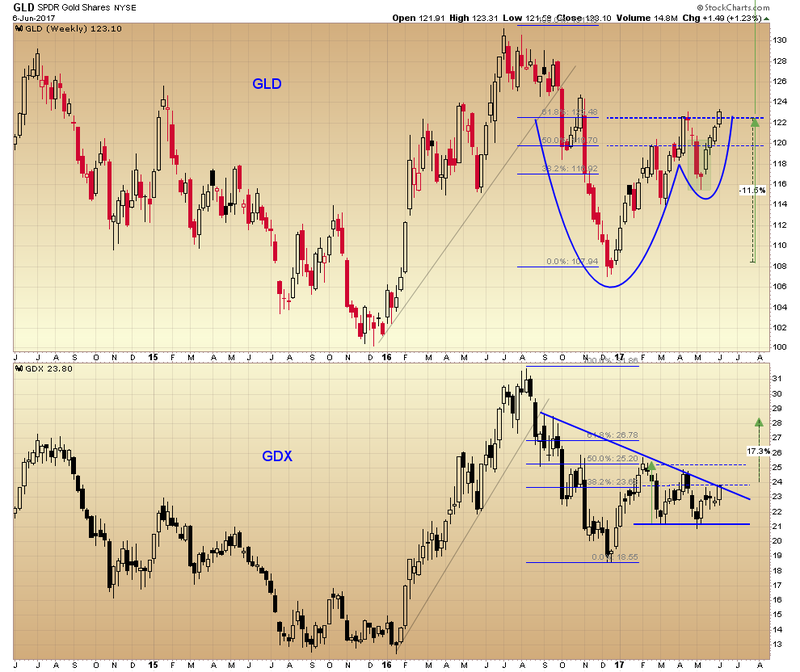 A break above the cup and handle rim line on the SPDR Gold Shares ETF chart projects a pattern price target objective measured by taking the depth of the cup and adding it to the rim line, and suggests an 11% move higher. 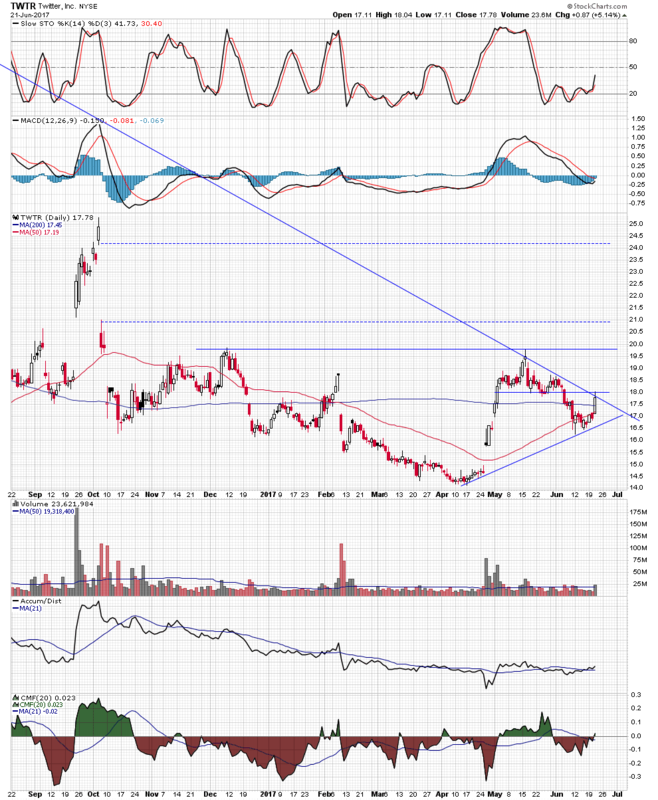 If the downtrend line is broken on the VanEck Vectors Gold Miners ETF chart, the triangle pattern projects a target price measured by taking the height of the triangle and adding it to the breakout point, and it projects a 17% move in the stock. “I think we’re going to see some outperformance in the financial sector, which was really the leader in Q4 of last year, which is the launch of the rally that then gets us to that 2,640 target,” says BTIG’s Katie Stockton, but Carter “The Chart Master” Worth has a lower target. 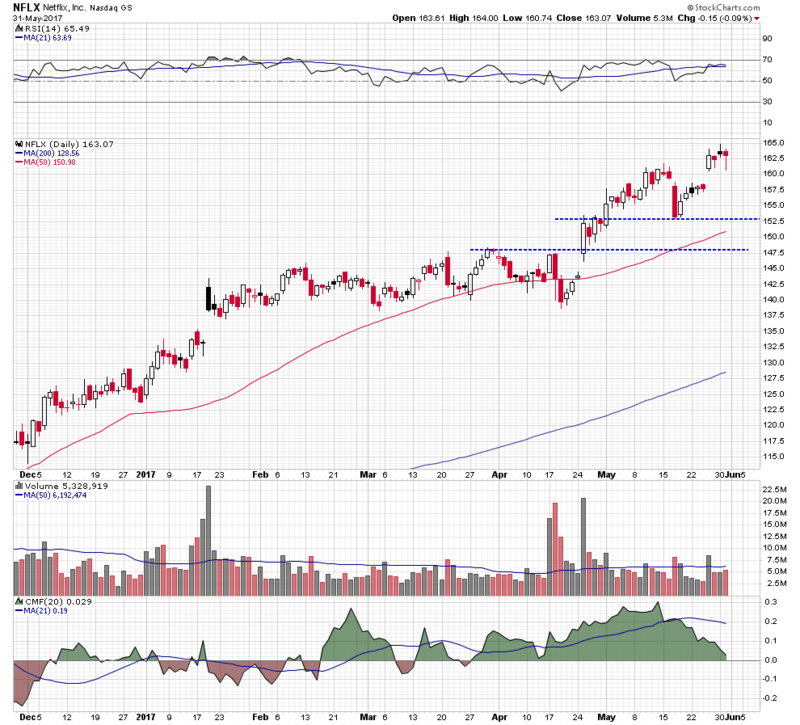 Shares of American Express (AXP) have been trading in a horizontal price channel for the past four months and are, once again, bouncing off pattern support and turning higher. 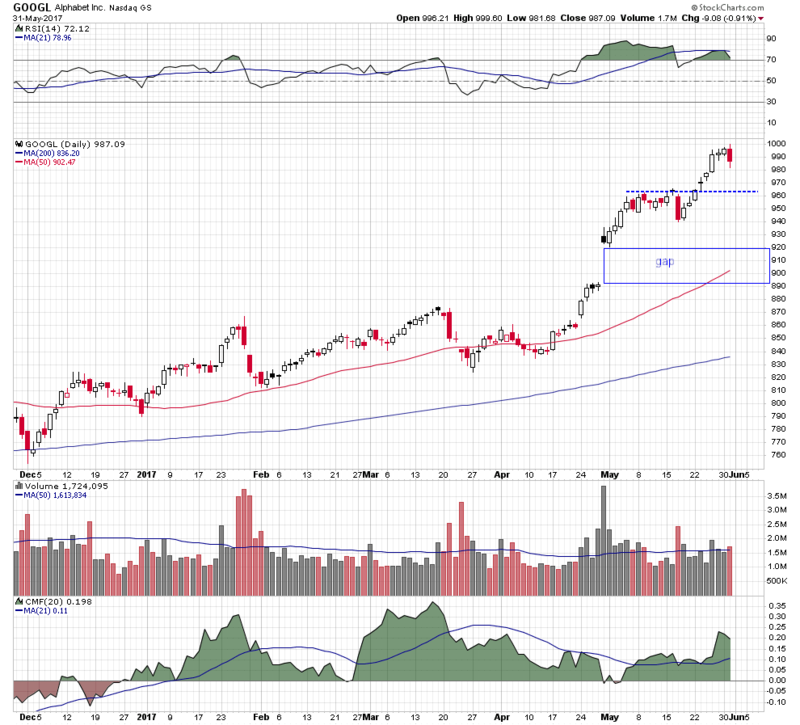 Price momentum and money flow indications reflect the bullish reversal, and the stock has moved back above its 50-day moving average, and center channel line resistance. It looks like it is headed for another test of upper channel resistance and a break above this level projects a retest of its all-time highs. The stock spent the greater part of 2016 basing below resistance supplied by the 38% retracement level of its 2014 high and 2016 low. It broke above this resistance in October of last year and made a perfect measured pattern move higher, reaching its price objective in February. That high near $81.50 has acted as channel resistance and the 62% retracement level of the 2014 and 2016 range, while the $75.50 area has supplied channel support. 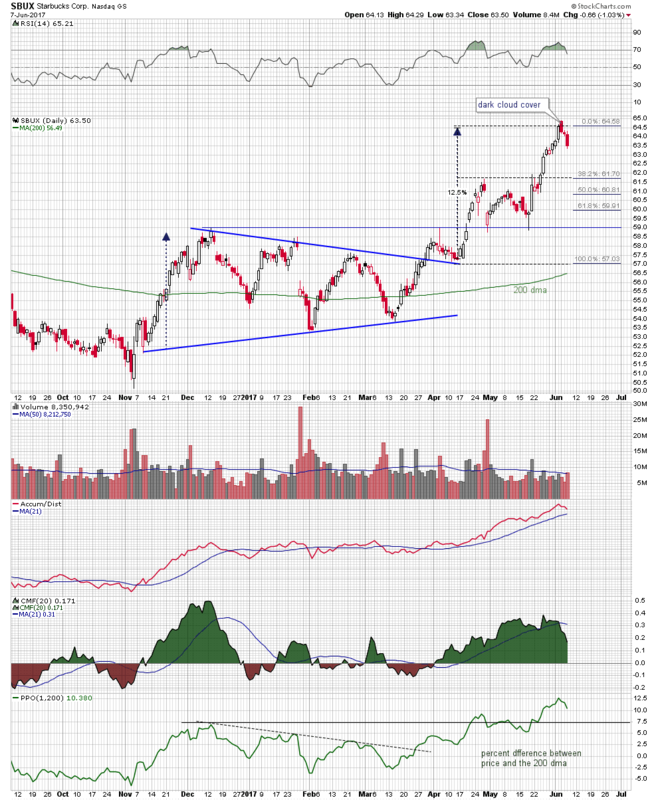 The channel center line at $78.50 has also been acting as internal pattern support and resistance, and the stock moved above it in Monday’s session. Last week, the relative strength index crossed above its 21 period moving average and center-line, and the vortex indicator, designed to identify early shifts in trend direction, made a bullish crossover. Chaikin money flow is in positive territory, and the accumulation/distribution line is above its 21 period signal average. The renewed positive momentum in the stock price is being supported by renewed buying interest. American Express is a buy at its current level using a position size that accommodates a stop-loss under the channel support line. Biotechnology stocks had an incredible run between 2012 and 2015, and the iShares Nasdaq Biotechnology ETF (IBB) was up 395% in that time. After making the record high, however, the space came under pressure and the fund dropped below its 40-week moving average, eventually retracing 50% of its historic rally before finding support in the $240.00 area. Since that time, it has been moving in a horizontal channel below the 38% retracement level of the pullback range in the $300.00 area, and 2016 triple-bottom support. Early this year, shares recaptured their 40-week moving average and began trading in the upper half of the horizontal channel. 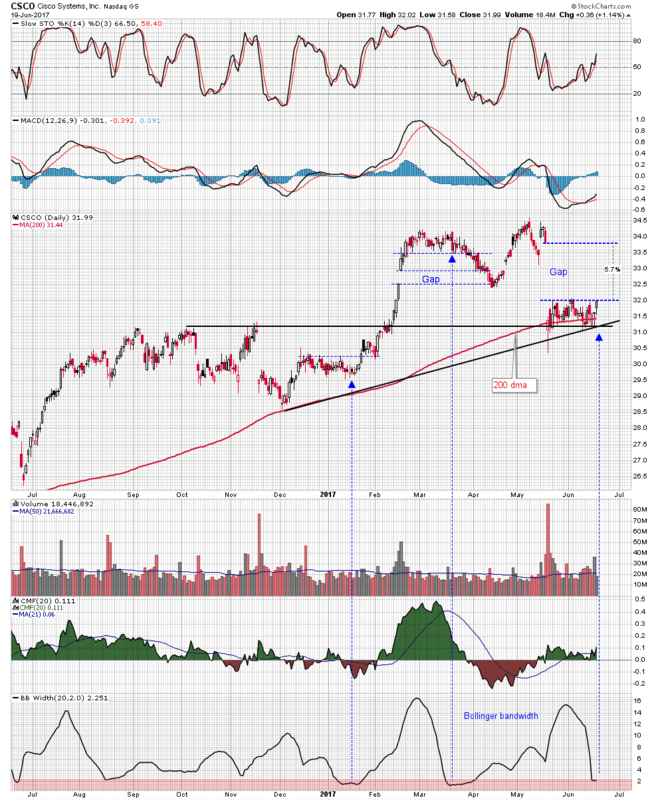 Chaikin money flow moved over its signal average and into positive territory and the relative strength index crossed back above its center line. The recent range contraction has compressed Bollinger bandwidth to level not seen since 2012 and, as the chart shows, periods of very low volatility are often followed by volatile breakouts. A bullish morningstar has formed on the daily chart just above the 200-day moving average. This three-period pattern consists of a large dark or down-day candle, followed by a narrow opening and closing range candle, and completed by large white or up-day candle. It is a reversal pattern that reflects a transition in trader sentiment from bearishness to bullishness. The fund price has re-entered upper-channel range and recaptured its 50-day moving average on strong volume and positive Chaikin money flow. Moving average convergence/divergence is making a bullish crossover, and the stochastic oscillator is crossed above its centerline, reflecting improving price momentum and renewed buying interest. 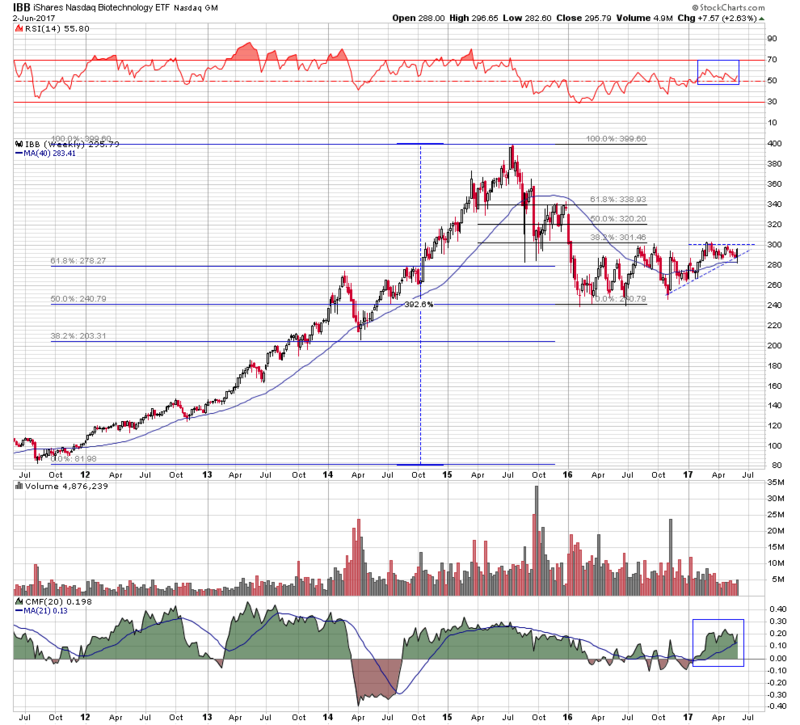 The IBB looks like it is preparing for another retest of the long-term resistance, and a breakout has the potential to initiate a volatile move and potentially return the sector to its long-term uptrend. Shares of Alphabet (GOOGL) were up 5.8% last month and Amazon (AMZN) and Netflix (NFLX) were both up 5%, but Facebook (fb) was down in the May just over half a percent. While the price action of one stock cannot be extrapolated to include all members in a very strong sector, when the bearish divergence is in a stock like Facebook and the group is the FANG stocks, it warrants attention. In Wednesday’s session bearish candles formed on the daily charts of all the FANG stocks, each accompanied by strong downside volume. A bearish engulfing candle which encompasses the overall range of the previous two trading sessions can be seen on the Facebook chart. The relative strength index moved out of an overbought condition earlier in the month and is below its 21 period moving average, and this week Chaikin money flow dropped below its signal line. 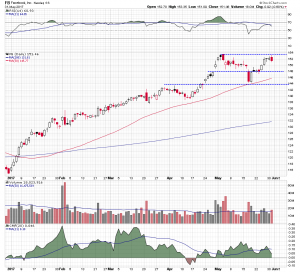 Support is situated at the $148.00 level and the stock’s recent high is resistance. 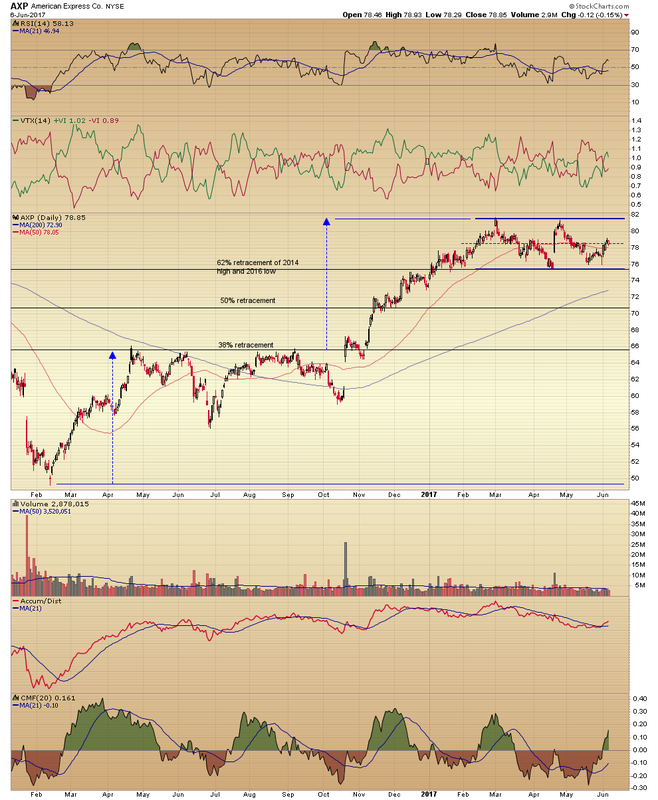 These are the levels to watch over the short term. A hanging man candle and formed on the Amazon chart, which is identical to a hammer candle, with the real body or opening and closing range situated at the top end of its overall range and a long lower shadow or tail, the only difference being one forms at the end of the downtrend or on support and the other forms of the end of an uptrend or at resistance. Positive Chaikin money flow has been declining since April and the relative strength index is extremely overbought. 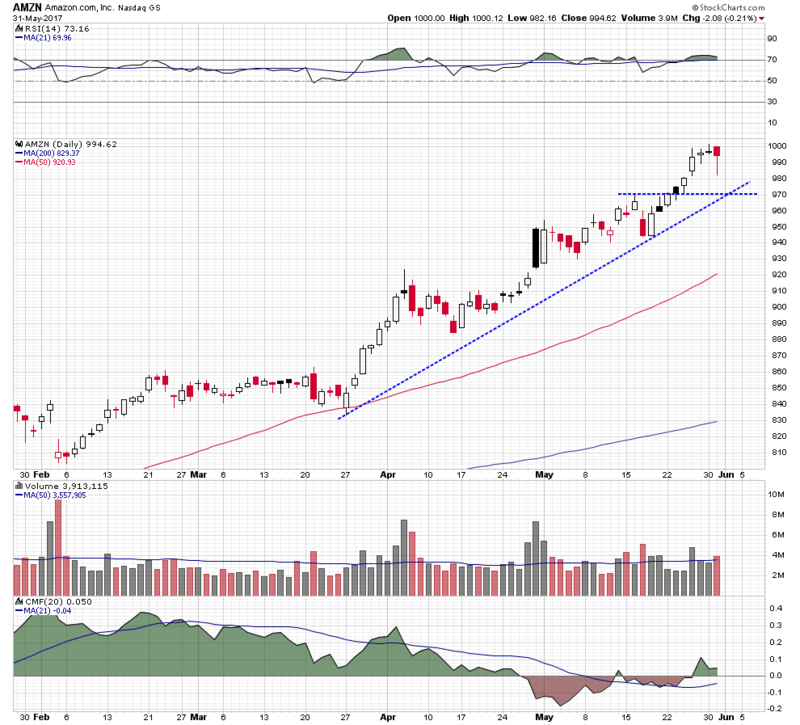 If the stock were to pull back the intersection of trend lines in the $970.00 would be a logical level to retest. 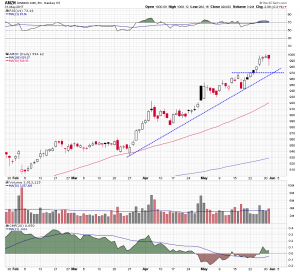 The hanging man candle also formed on the Netflix chart above the small upside gap. Chaikin money flow has been declining for the last two weeks and looks prepared to enter negative territory. The relative strength index moved out of an overbought condition earlier in the year and has remained above its center line since April. 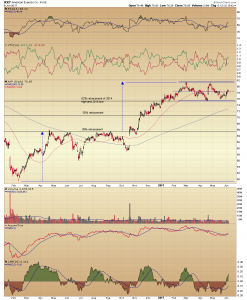 A pullback in Netflix could see the stock return the $152.50 area. 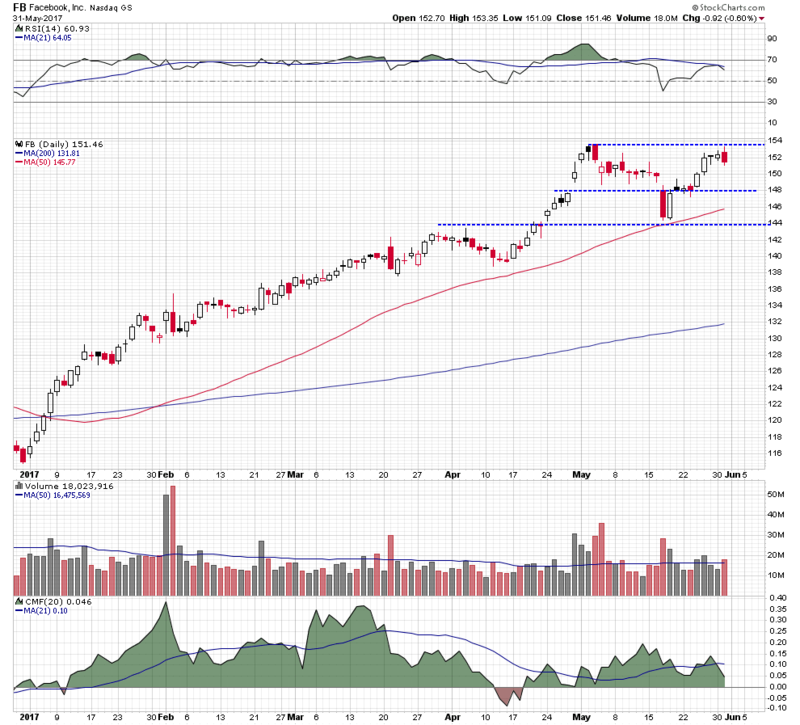 An engulfing candle formed on the Alphabet chart, again engulfing the two previous trading sessions. The stock moved back above its rising 50 day moving average in early April and then closed out that month with a strong upside gap. The relative strength index has remained in and overbought condition the most of this time and Chaikin money flow has been positive territory. An initial pullback should revisit the $963 area, but the large gap remains a vacuum to be filled.